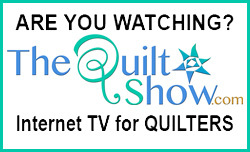 Of course many of us make personal resolutions for the new year but what about making a quilting resolution? 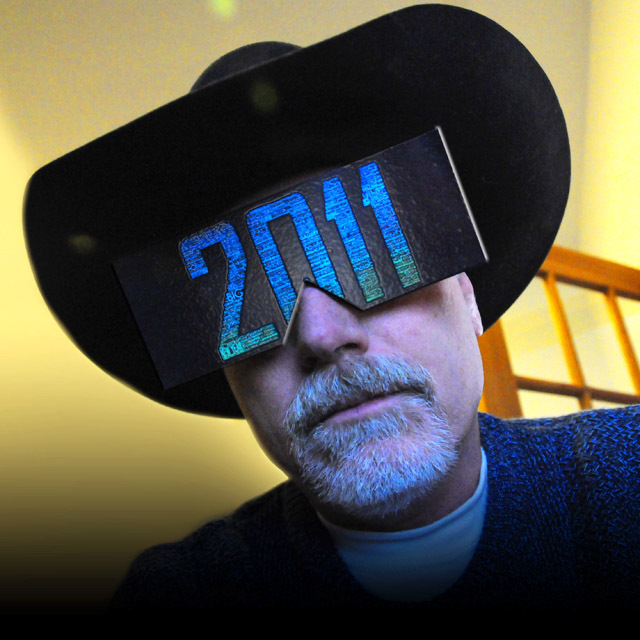 Did you set any creative goals for yourself this year? Are you going to finish "that project" or learn something new? If so, chime in and tell me about it. I'd like to know. I'm planning on finishing a major quilt. With my schedule that should be a challenge! Will you help hold me to it? To enter my finished wall quilt in a competition. It is only my third piece to complete. It was quilted by Rebecca Lilly Segura and I did the improvisation painting in a Jane Dunewold class on using soy wax and dyes. I love it! I set out this year to finish five projects that I started. I have a problem with cutting, I like to do it to much and have cut my quilts out and then left them. I have resolved to finish at least five of the 31 I have started. So far two are complete and one more on design wall which was a block of the month I started. I just have to quit giving in to the urge to start new ones and complete those before the others. Yes, I have slipped on done three of those already this year. It is a work in progress right? I live in SC and the guild that I am a member has a UFO Challenge this year. So, I am trying real hard to keep focused on the unfinished Objects before starting news ones. and keeping the new ones small and easy. I am working on a French Braid quilt that I started over a year ago and took a class for it at Quilting Connection. One of my resolutions is to complete quilts I've started so that I can put them on my quilting frame and stipple them, then try to sell them. 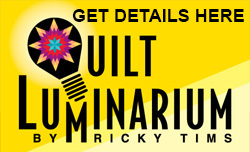 Not sure how to market my quilts though. Will have to check the internet to see what is suggested. 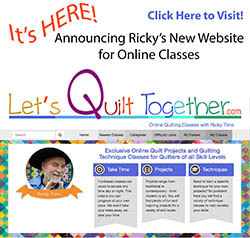 Love your quilts Ricky! I RESOLVE to finish all the kits/fabric bundles I purchased over the past 12 years and not buy any new fabrics - sorry but I need the space and the hubby is growling! Now retired I should be able to knock them out in no-time - HA! Iam going to quit procrastinating and decide on a pattern for my Granddaughter's memory quilt and start it. She was in the Czech Republic almost 2 years ago now and she wants to have those memories. It would be nice to finish it before she graduates from college in 3-1/2 years! I RESOLVE not to feel guilty when I buy fabric with absolutely no future use in mind. It makes me immensely happy to buy it, fondle it and just look at it and that makes it worth it! I RESOLVE that next year when I look at that same fabric and wonder why the heck I bought it, I still won't feel guilty but simply pass it on to a friend, the Goodwill, a retirement facility, or an organization that does charity quilts. I RESOLVE that I will continue to guard carefully my sewing and quilting time. This keeps me happy and able to serve the rest of my world. I RESOLVE that I will continue to support and encourage all the young people in my life who take an interest in this craft that I am so passionate about. I RESOLVE to surround myself as much as possible with friends who love quilting and fabric collecting as much as I do. And lastly, I REFUSE to put deadlines or limits on my creative spirit. To make 13 quilt tops for our guild to quilt and bind for our area hospice.